Prices also vary significantly across the country. In Inner London – the most expensive region in the UK – the price of a part time nursery place for a child under two is £175 per week, or £9,100 per year, compared to an average £108 per week in Yorkshire and Humberside, or £5,600 per year. Even if they could afford it, many parents will struggle to find the childcare they need. In England, only just over half of local areas have enough childcare for parents working full time. Some families will face even bigger gaps – less than a quarter of local areas have enough for disabled children and parents working outside the usual 9 to 5. Most parents will be able to get some support with paying for their childcare, including from two new schemes introduced in 2017 – 30 hours funded childcare for three and four year olds with working parents in England, and Tax Free Childcare across the UK. While many families welcome this support with childcare costs, others may be missing out on the help that’s available because the system is so complex. There are seven different ways families in England can get support – all with different eligibility criteria. Some Government support has failed to keep up with childcare price inflation: in 94 per cent of local authorities, a full time nursery place for a child under two is now more expensive than the maximum costs supported under Universal Credit and Working Tax Credit. Families in these areas will find that they may end up worse off working, or working more hours. “Childcare is every bit as vital as schools, healthcare or transport: it supports parents to work, provides our economy with a reliable workforce and boosts children’s outcomes. But too many parents remain locked out of work by high childcare costs and low availability, and too many children miss out on high quality childcare, and the benefits to their life-chances that come with it. Increase the maximum amount of childcare costs that are supported by Universal Credit in order to make sure parents are better off for every extra hour worked, and switch to upfront payments so that parents can afford to move into work. Provide start up grants and responsive funding for childcare providers to increase the availability of childcare places. Extend the 30 hours entitlement to parents undertaking training to make sure childcare costs do not prevent parents from developing the skills and employability that drives social mobility. Improve access to early education for disadvantaged children by doubling the early years pupil premium. Consider how current spend on childcare could be reallocated to better meet the needs of disadvantaged and low income children, including current underspend of the Tax Free Childcare budget. Contact: Megan Jarvie, telephone: 020 7239 7536, mobile: 07538 334 722, email: press@coramfamilyandchildcare.org.uk or megan.jarvie@coramfamilyandchildcare.org.uk. 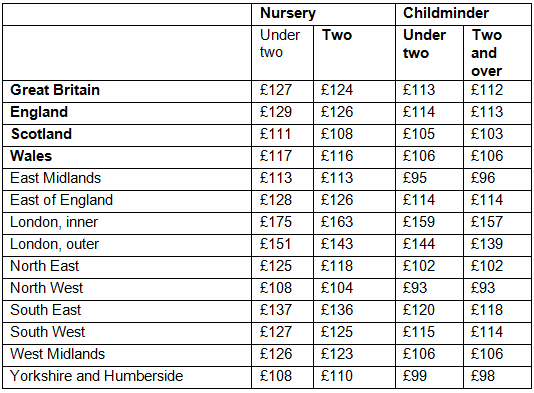 The average price for a part time (25 hours) nursery place is Britain is £124 per week, 4 per cent higher than in 2018. Parents can get support with their childcare costs throughout Britain through Working Tax Credits, Universal Credit, Childcare Vouchers and Tax Free Childcare. England, Scotland and Wales also each have several different schemes offering funded childcare to some two, three and four year olds. See the full report for further information. The Tax Free Childcare scheme pays £2 for every £8 parents pay for childcare, up to a maximum of £2000 per child per year. The 30 hours extended entitlement rolled out in 2017 in England, providing parents of three and four year olds who are each working a minimum of 16 hours a week an additional 15 hours per week during term time of funded childcare above the universal 15 hours of funded childcare that all parents of three and four year olds are entitled to.